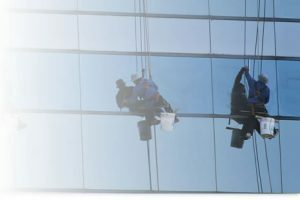 We offer a comprehensive window cleaning service which includes both cradle and abseiling. This type of cleaning is a necessary practice for most high rise buildings as access is limited with other forms of high reach processes. All our operatives are fully trained and qualified in high level work, all equipment is also subject to PASMA certification. Strict safety checks and site preparations are in place for each operation which protects both the technicians and the public. Work is scheduled to limit any risk due to environmental elements (such as high winds), and to avoid as much as possible inconveniencing staff and the public. Abseiling is an efficient and cost-effective window cleaning service. This technique is primarily favoured where wind will affect a cradle, such as between office blocks, but might also be a process of choice or dependant on the building design. Cradle access is similar to Abseiling but with the obvious advantage of allowing 2 operatives to work together in a cradle thus covering a larger area during their descent. Cradle work is more hazardous in windy conditions, hence our contracts are designed to take into account scheduling this activity only when conditions are acceptable.